Let’s ride! Winter is no time for horsing around, so at Turpin Meadow Ranch we’ve modernized what it means to be a cowboy by adding snowmobiling to our list of winter activities. With Ski-Doo Expedition 4 stroke snowmobiles fueled and ready to ride, exploring Turpin’s 2.5 million acre wilderness backyard is fast, fun and exhilarating. Located on a spur of the famed Continental Divide Trail, Turpin offers riders endless trails to explore the Wyoming Winter. Also, we’re located near a vast snowmobile trail network in and around Jackson Hole so each ride is as unique as each snowflake and your only worry is whether you’re having too much fun. 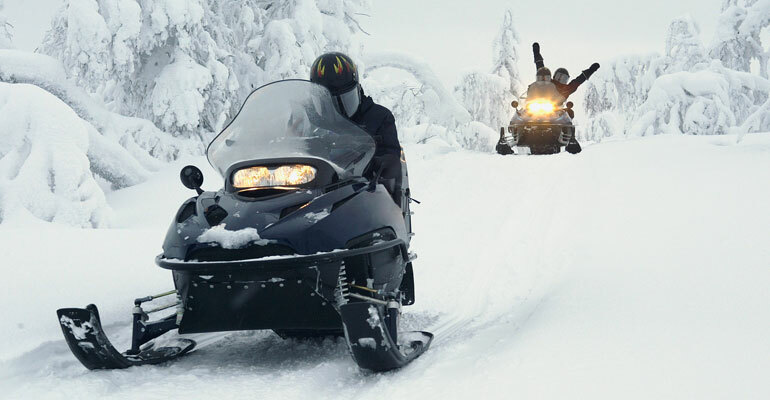 Capable of 7250 RPM, our snowmobiles mean serious business. With powerful machines like this, cutting through layers of fresh powder will be like cutting into a soft pancake on Christmas day. Equipped with intelligent throttle control features – these light, snow-dominating machines offer superior maneuverability in Jackson Hole’s world-class powder. The view from our trails just can’t be beat. Where else can you ride in the shadow of the Grand Tetons and admire beauty that breathtaking? Our ranch is situated between Yellowstone and the Grand Tetons, meaning that you can explore the spectacular winter sights of both National Park worlds on board your snowmobile.